There’s the retortable can, the glass jar, the tube and the stand-up pouch… but now available in South Africa is the retortable tub, introduced by Polyoak Packaging’s Dairypack Tubs at this week’s Propak Cape expo at the CTICC. This retortable tub range is now available exclusively from Dairypack Tubs, for the first time ever in this country, in licensed partnership with SuperLock, RPC Superfos. The extraordinary feature of this advanced technology is that the barrier protection is possible on all surfaces of the tub which, together with the membrane seal on top, achieves an extremely low oxygen transmission rate. This means that convenience products can stay on shelf two to three times longer than in reference packaging. Owing to the special material used and proprietary label technology, this innovative injection-moulded solution is fully retortable in an autoclave. This is a significant step forward for rigid plastic packaging as it extends shelf life for up to 24 months under ambient conditions, offering optimal product freshness and consumer convenience. Such ambient solutions present a significant opportunity for products to be distributed throughout Africa with its limited cold storage and sparse domestic refrigeration. The tubs can be hot filled, meaning that processed products traditionally packaged in glass or tin such as fruit, jam, pickles, soups and sauces can now be packed in cost-effective, light weight tubs that give the visual impression of glass. These mono material tubs are easily recyclable and in addition to being microwave, dishwasher and freezer safe, they are BPA free. 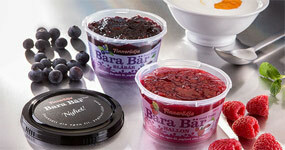 Equally the tubs are a great solution for cold filled products such as salads, dips, yoghurt and cheese. These liquid tight packs are even effective for highly sensitive foods such as cold meats, shellfish and fish based products. Consumers, says Dairypack, will appreciate the eye-catching in-mould label decoration with razor-sharp print quality possible on all surfaces, and the appetising view of the product through the glass clear transparent display window. It also has a practical click-on screw lid which contributes to longer product life in their kitchen. Food manufacturers, it adds, will appreciate the operational benefits of robust, low weight packaging that stacks perfectly, generates low noise on the filling line, and reduces the risk of breakages. Ultimately the new retortable barrier tubs can deliver significant cost savings in an optimised supply chain with reduced warehouse and transportation costs.